Generally a Spoons fan and my football team played their home games at Wembley for the season just gone. As I live on the Thameslink corridor, so getting to Cricklewood is easy, and this pub is near to Willesden Green station for the short hop on the Jubilee line, I decided to pay a visit. Very standard across the board, wasn't busy at all on football days with glass glasses in use, good real ales on selection as per Spoons policy, food quick, app efficient if you're lazy like me. Usual punters. Some of the conversations you hear are fascinating. Needs a lick of paint but I supposes it disguises a good honest institution. Now the season's over I guess I won't be back for a while - but next time we're at Wembley I know where to go. tatty & limited beer range, latter one of the worst I've seen in a 'Spoons. Whatever you do, don't try the currys - the thai one especially, it is beyond awful! I have been using this pub for five years as it is the local of a friend of mine. I have to say that it is certainly the best pub n The Broadway, but not much to beat. It has the usual Wetherspoon, excellent Ales and reasonable value wine. But the pub is dingy and smelly and has the usual Wetherspoon urine soaked,seldom cleaned, toilets . What a mess! Be prepared to run the gamut of the endless smokers at the door. The food is of the frozen supermarket packet cuisine. 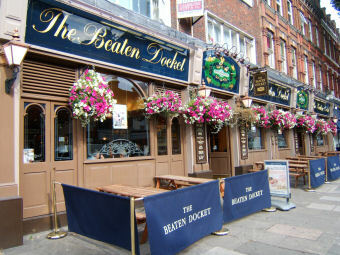 But...the best pub in the street!